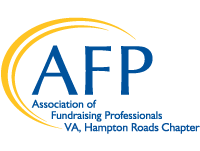 Throughout the year AFP Hampton Roads provides opportunities to our members to receive scholarships for different conferences and to help with chapter membership. These applications can be found under the dropdown tab. • Applicants must be a newcomer to fundraising and should attend all AFP-HR meetings if selected as the winner. Winner may not transfer award to another recipient. • This scholarship is for 1 year AFP Membership.